Keyboards and mice can often be reused. However, if they are not in a re-usable condition, the best option is to recycle them. There are no cost to recycle your keyboard or mouse, we also don’t have any limitations on the quantity that you want to recycle, we will accept them all, your keyboards for recycling in one batch. We also have a same day recycling pickup service which you can select during scheduling. We Make Computer, Mouse and Keyboard Recycling EASY! What happens to your keyboard or mouse? All keyboards and mouse are dismantled and sorted at our facility. Most recyclers simply shred or bale and export their keyboards. However, because we dismantles the keyboards, there are many more uses for the recycled material. These materials recovered from keyboards include plastic, rubber, wire, metal, and Mylar. Mice are taken apart and recycled for their plastic, wire, and circuit boards when applicable. There are three main parts that make up a personal computer. The computer is the large steel box which contains the hard drive, DVD or CD, power supply, mother board, and the processor. The computer may also contain other components such as the sound and video cards, and internal modems. The monitor could be the newer LCD or older CRT type, it is the screen, or the part of the computer that looks like a television. The keyboard is the part which, not surprisingly, looks like a typewriter keyboard. 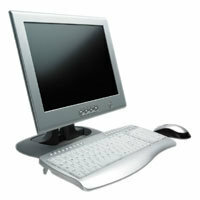 In some older models, the computer may be housed in the same case as the monitor or the keyboard. For the purposes of this fact sheet the keyboard is considered to be part of the computer.